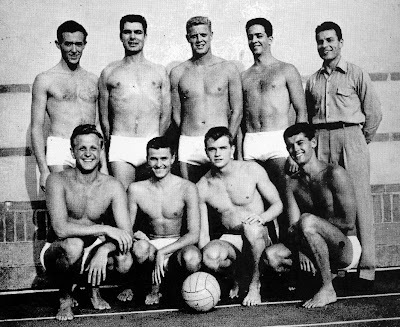 The team University of California, Los Angeles in 1950. Back row: Jophn Chandler, George Barlow, Jerry Ladhoff, Webb Coulter and Coach Brud Cleveland. 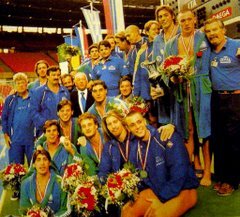 Front row: Joe Popovich, John Gilespie, Larry Ball and Monte Nitzkowski (the legendary coach of the US team from 1972 to 1984).